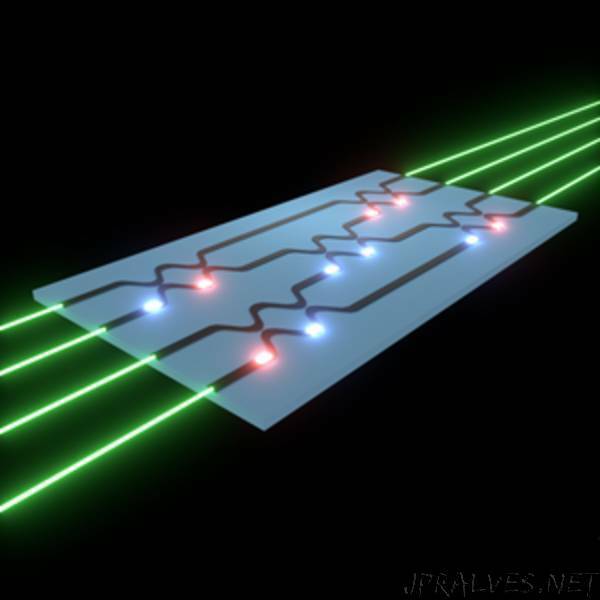 Researchers have shown that it is possible to train artificial neural networks directly on an optical chip. The significant breakthrough demonstrates that an optical circuit can perform a critical function of an electronics-based artificial neural network and could lead to less expensive, faster and more energy efficient ways to perform complex tasks such as speech or image recognition. An artificial neural network is a type of artificial intelligence that uses connected units to process information in a manner similar to the way the brain processes information. Using these networks to perform a complex task, for instance voice recognition, requires the critical step of training the algorithms to categorize inputs, such as different words. Although optical artificial neural networks were recently demonstrated experimentally, the training step was performed using a model on a traditional digital computer and the final settings were then imported into the optical circuit. In Optica, The Optical Society’s journal for high impact research, Stanford University researchers report a method for training these networks directly in the device by implementing an optical analogue of the ‘backpropagation’ algorithm, which is the standard way to train conventional neural networks. Although neural network processing is typically performed using a traditional computer, there are significant efforts to design hardware optimized specifically for neural network computing. Optics-based devices are of great interest because they can perform computations in parallel while using less energy than electronic devices. In the new work, the researchers overcame a significant challenge to implementing an all-optical neural network by designing an optical chip that replicates the way that conventional computers train neural networks. An artificial neural network can be thought of as a black box with a number of knobs. During the training step, these knobs are each turned a little and then the system is tested to see if the performance of the algorithms improved. The new training protocol operates on optical circuits with tunable beam splitters that are adjusted by changing the settings of optical phase shifters. Laser beams encoding information to be processed are fired into the optical circuit and carried by optical waveguides through the beam splitters, which are adjusted like knobs to train the neural network algorithms. In the new training protocol, the laser is first fed through the optical circuit. Upon exiting the device, the difference from the expected outcome is calculated. This information is then used to generate a new light signal, which is sent back through the optical network in the opposite direction. By measuring the optical intensity around each beam splitter during this process, the researchers showed how to detect, in parallel, how the neural network performance will change with respect to each beam splitter’s setting. The phase shifter settings can be changed based on this information, and the process may be repeated until the neural network produces the desired outcome. The researchers tested their training technique with optical simulations by teaching an algorithm to perform complicated functions, such as picking out complex features within a set of points. They found that the optical implementation performed similarly to a conventional computer.